In this video, you’ll learn a little about the daily activities of billers and coders and why this is one of the fastest-growing fields in the healthcare industry. Now is a very good time to look at a career in medical billing and coding. The American health care system is modernizing just as a large portion of the populace enters retirement, and the demand for health care professionals who can process crucial data is growing daily. 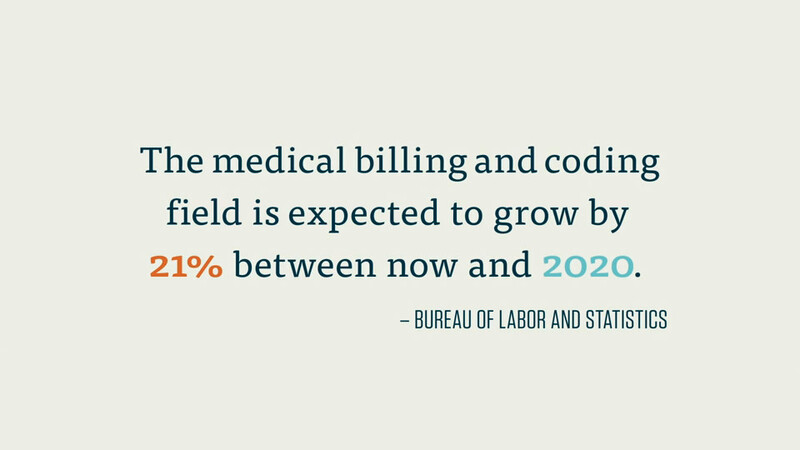 According to the Bureau of Labor and Statistics, the medical billing and coding field is expected to grow by 15% between now and 2024. That’s almost 30,000 job openings in the next seven years. Not only are there a large number of job openings in coding and billing, many of these jobs are fairly lucrative. The median salary for coders and billers was $38,040 in 2016—that’s $18.29 an hour when you’re starting out. The top 10% of coders across the United States make $62,840 annually, and coders in some states make even more than that. The field of medical billing and coding is growing as a result of a number of factors, chief among them being an aging population, an increasing focus on health data and informatics, and the digitization of health records. As the health care system turns increasingly to electronic health records, billing and coding specialists who are computer-savvy will have a leg up on the rest of field. Let’s now take a look at some of the day-to-day tasks performed by professional medical coders and billers. Bear in mind that, occasionally, one person performs the duties of both positions. Professional coders start the day by reviewing the reports they have to code. Their job is relatively straightforward: a coder examines a doctor’s report from a procedure or checkup, and then the coder determines the best way to translate this into code. For example, a note may read that a patient visited the doctor with a sore throat. Upon examination of the throat, the doctor suspected streptococcus, a common infection of the throat. The doctor performed a rapid strep test. With a positive diagnosis of strep throat, the doctor prescribed a week’s worth of amoxicillin, an antibiotic drug. The coder will then enter the correct codes into a form or, more often, a computer program, and then move on to the next report. This process of reading reports, translating them into the correct code and entering them will continue for the rest of the day. Most coding is relatively straightforward, and most coders become familiar with the codes for the more common procedures completed in their respective office. A coder for a general practitioner, for example, will become very familiar with the codes for a general office visit (99214) and flu shots (90658). Coders must adhere to the guidelines for each code. Certain conditions, for example, need to be coded in a particular order. Still, there may be instances where there is significant confusion or a gray area in the code. Coding guidelines may also get incredibly intricate and specific as the symptoms, conditions, or procedures performed get more complicated. In cases where referring to the appropriate manuals and their guidelines is not sufficient, most coders will reach out to the larger coding community for advice and guidance. Above all else, the coder must make sure that the procedure code used corresponds to the diagnosis code. If the procedure listed does not make sense with the diagnosis provided, this may result in a rejected claim, which can muddy the reimbursement process considerably. One last point: Each medical office has a specific lag time for coding reports. This lag time is typically two to five business days. That means that coders must complete their coding within five days of the procedure or doctor’s visit. Hitting these deadlines ensures that the billing and reimbursement process can move along smoothly. It’s the coder’s responsibility to manage these deadlines and work in a timely, efficient manner. The job of the medical biller begins as the medical coder’s job ends. As we learned in Course 1-2, it’s the medical biller’s responsibility to create accurate, legal bills for the healthcare provider’s office and to send them in a timely fashion to an insurance company, or payer. It’s also the biller’s job to send out and collect payments from patients. What follows is an abbreviated description of the medical billing process. For a more in-depth look at the biller process, please refer to Course 3-4. The medical biller’s day involves a number of different processes. The medical biller is responsible for creating accurate, formally correct claims, checking for accuracy in transaction reports, and creating bills for patients. First, the medical biller takes the codes from the medical coder, whether in a form or via a computer program, and creates a medical claim. As we covered in the last course, a claim is an itemized list of procedures, services, and costs that is sent from a healthcare provider to a payer in order to collect reimbursement for the provider. This process, while simple in theory, can be very complicated. First, the biller must confirm that all of the codes correspond to one another. Consider this a quality check after the medical coder completes their report. This requires the medical biller to be familiar not only with medical terminology, but also with the current forms of CPT, ICD and HCPCS codes. Medical billers must also become familiar with the patient’s insurance policy in order to determine if the procedures and services performed by the healthcare provider are covered by that patient’s plan. Essentially, the medical biller needs to make sure that each code, and thus each procedure, listed on the claim is actually billable. This generally depends on the payer and the contract the healthcare provider or patient has with that payer. Each insurance payer has a set of rules or guidelines that determine what can and cannot be billed for under the policyholders contract. Medical facilities each have different rates for particular procedures as well, so a medical biller must create a claim that corresponds to the provider’s established rates. The medical biller takes all of these considerations in mind and creates an accurate medical claim, and then sends it off to the payer. Depending on what payer the medical biller is sending the claim to, the claim may first go through a clearinghouse or straight to the payer. We’ll cover what a clearinghouse is in Section 3-2, “Medical Billing Vocabulary and Key Terms.”. For now, just know that certain payers and clearinghouses require specific forms or software. If you are sending a claim to Medicaid, for example, you must the claim as a CMS-1500 form. We’ll cover this process in more depth in Section 3. Once a claim is sent out, the payer performs an evaluation known as payer adjudication. This is a process we’ll cover in more depth in Section 3, as well. Essentially, the payer decides how much of the bill it will reimburse the provider for and sends it back to the provider in the form of a transaction report. The biller then reviews this transaction report and checks it for accuracy. The biller makes sure the charges and reimbursements correspond to the provider’s agreement with the payer. If the transaction report is accurate, the biller then processes a bill for the patient, with an explanation of which services and procedures are covered, and for how much, and which procedures the patient is responsible for paying for. The final phase of the medical biller’s day is that of collections. Should a patient be unable or unwilling to pay for the medical services rendered, a medical biller is in charge of sending them reminders and, as a last resort, sending their bill on to a collections service. The collections process varies, and depends on the healthcare provider’s policy. Now that you’ve learned a little bit about the day-to-day activities of both medical billers and medical coders, it’s time to learn about the certification process in both of these fields.